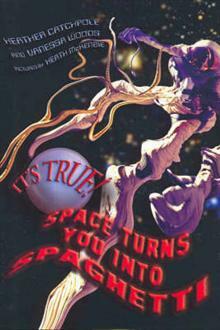 Part of a non-fiction series, this book contains facts about space. It talks about exploding stars, boiling planets, robotic explorers, black holes, white dwarfs and red giants. It aims to show what life would be like on Mars, what it takes to become an astronaut and how to hunt ... read full description below. Watch out for exploding stars, boiling planets and robotic explorers. Beware of black holes, white dwarfs and red giants. Space is full of extraordinary things - and two-thirds of the Universe is invisible! Packed with mind-blowing facts about space, this is the sixteenth book in the fantastic non-fiction series, It's True! PSSST! It's True! This is the best book on SPACE you'll ever read! The last frontier is a dangerous place. Watch out for exploding stars, boiling planets and robotic explorers. Beware of black holes, white dwarfs and red giants. This book will send your brain into orbit. Find out what life would be like on Mars, what it takes to become an astronaut and how to hunt for aliens with your computer. Zoom past planets and rocket round galaxies. But be careful - two-thirds of the Universe is invisible and if you take a wrong turn you might be spaghettified! Blast your buddies with all things extraterrestrial. Heather Catchpole is an artist and a poet, but her favourite occupation is writing about science because it involves learning about the amazing way the world, and the universe, work. Originally from Canberra, Vanessa Woods has spent time in the jungle in Costa Rica chasing monkeys and filming short segments for the Disney Channel on weird, quirky, and amazing animals all over the world. Vanessa has written articles for various magazines and was recently Communications Coordinator for Discovery Networks before moving to Germany to work as the PR Director for a chimpanzee research group. This is the second It's True! book that Heather and Vanessa have written.